As the riders from the Bike Tour to Save the Boundary Waters have traveled from Winona to Ely, they have been sharing photos, videos and reflections from the road. Below is a look at selections from their Facebook diary. For more, follow them on Facebook, Twitter and Instagram. Read about organizing this amazing expedition here. April 2 in Winona: Already off to a great start at Winona State University today. 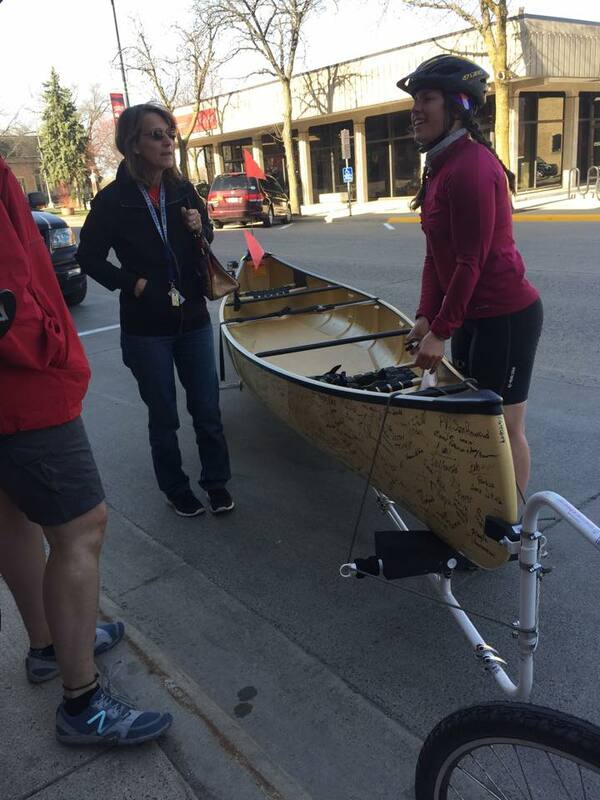 Meeting amazing supporters and getting signatures for the canoe. Great end to the day at the Boat House, where we met supporters and shared about the Campaign to Save the Boundary Waters with Steve of Piragis Northwoods Company. April 7 in Mankato: Thanks Mt Olive for letting us park in your yard and letting us play along at recess! 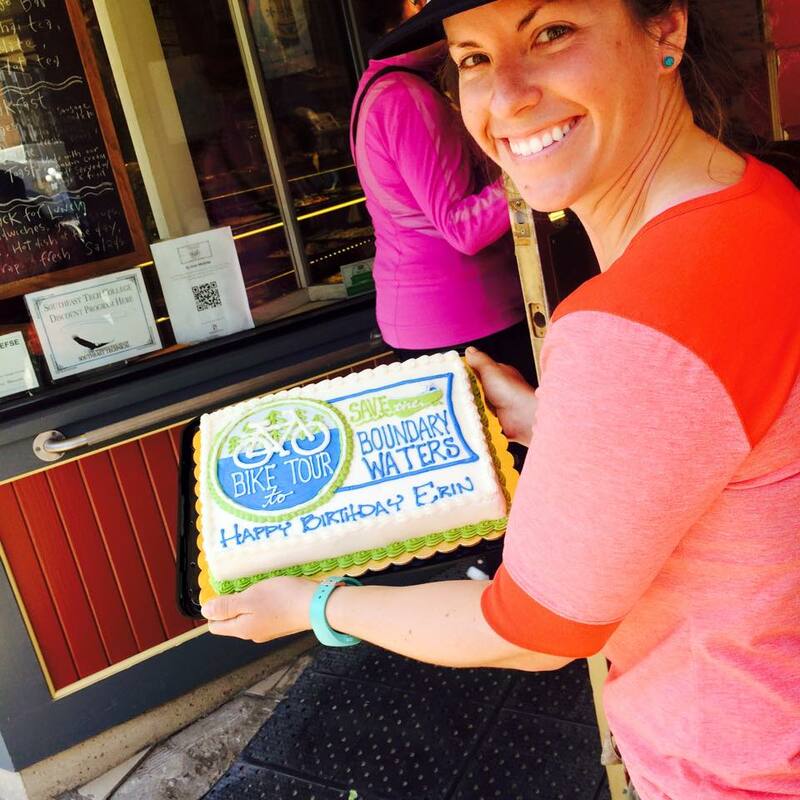 April 11 in Red Wing (Erin's Birthday): Happy 30th! 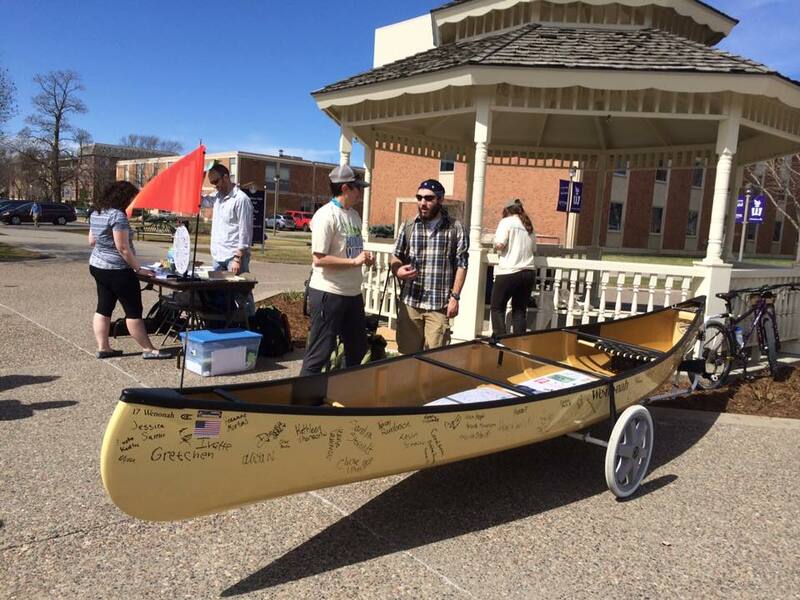 Come sign the boat at Hanisch Bakery! 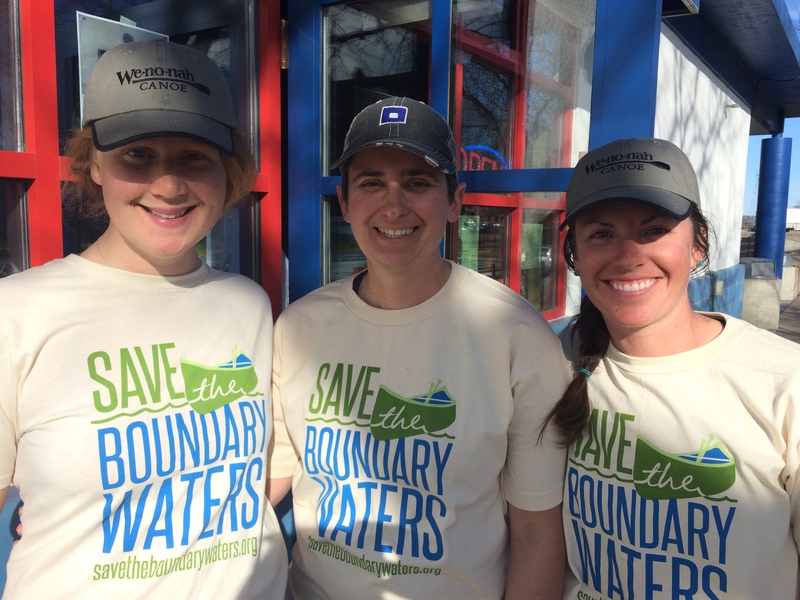 April 14 in Northfield: We've been finding that even people who have never been to the Boundary Waters know how important it is to protect. We met some folks on the street today outside Tandem Bagles and FIT to be TRI'd eager to support the effort. Paul said "I haven't been there myself but I have a lot of friends that go. It's an important place for Minnesotans - all Americans actually, Canadians too. It's a national treasure that needs to be protected in perpetuity." April 15: Biking has become the perfect meditation, the grind between connection and mindfulness. We see a lot as we move across the state on county roads and neighborhoods, businesses and schools. To move in this way is to s l o w down the speed of life. To pause for the conversation that comes from a spectacle of a boat out of water. To allow the senses to smell the springtime air and the miles of dairy farms that pepper the lands of Minnesota. It is not unlike the way we travel in the Boundary Waters. Biking and paddling are both meditative practices. No one stroke or revolution is more significant than another, but the methodical patience that comes from synchronicity propels you forward. As we migrate towards the Northwoods and the BW there is a fondness that lingers, a recognition of favorite trees and stunning vistas. Have you seen the ancient cedar on Rice Bay, have you walked the stair portage on Rose Lake, or have you closed your eyes at the base of Lower Basswood Falls and felt the power of water resonate within? As I pedal along, I cannot impress enough about the majestic qualities of this wilderness. Please help to speak for the protection of the Rainy River Drainage Basin and thank Betty McCollum for proposing a bill to create permanent protection for this watershed. 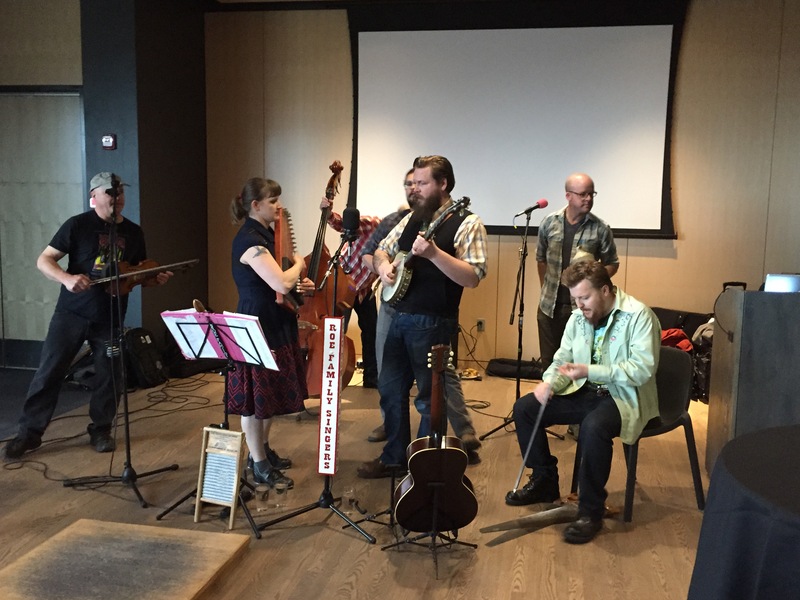 April 16 in St. Paul: Another great event! Thank you to our sponsor Patagonia for hosting us in St. Paul. We had a great time presenting with our friends Dave and Amy Freeman who completed the Paddle to DC last year. 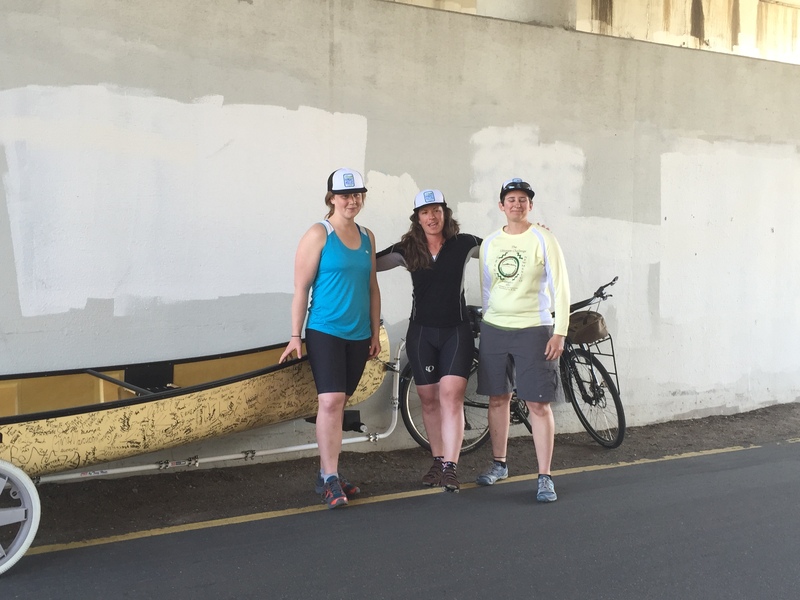 Their adventure advocacy is an inspiration! April 17 in Uptown Minneapolis: Interview at Gear Junkie -- read article and watch video. 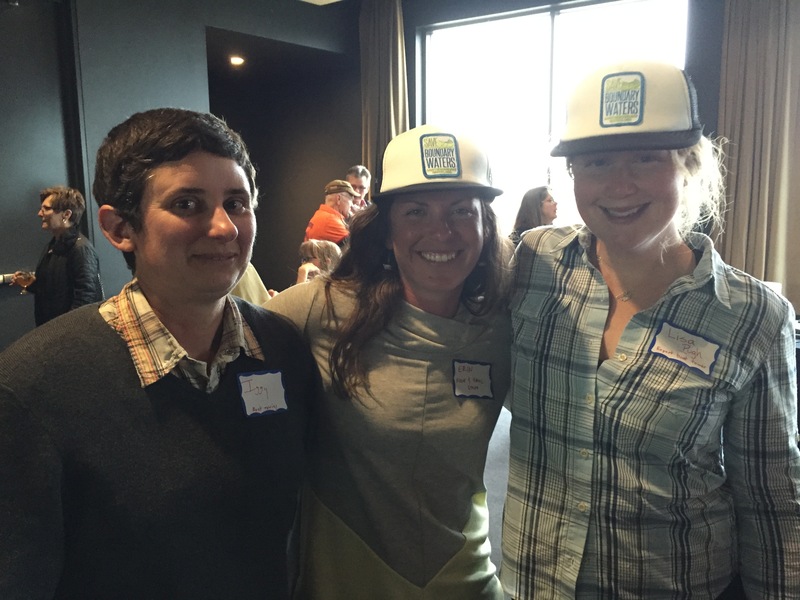 April 19 in Minneapolis: Glad to be here at Surly Brewing Company tonight to support the Campaign to Save the Boundary Waters! Great tunes from Roe Family Singers! April 23 in Minneapolis: Thanks Joseph for being an inspiration and motivation. We think about you every day and want you to know how much we appreciate you and your efforts. Read Joseph's story and see the rider's video thank you. April 24 in Minneapolis: Hey! 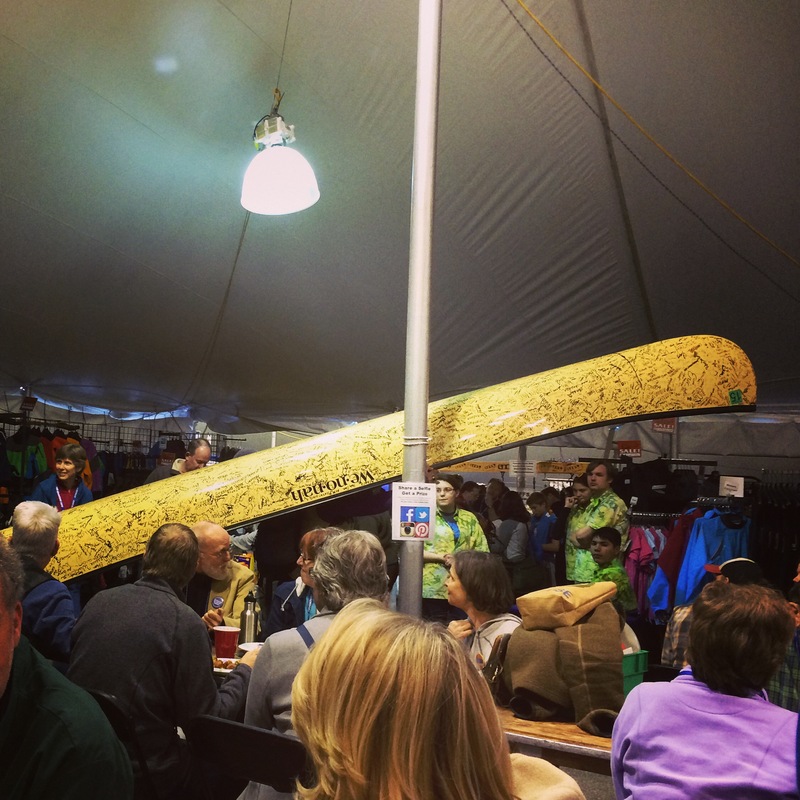 We're at the Midwest Mountaineering Outdoor Adventure Expo! We will be here all weekend and we want to see your face. Look for the giant boat next to the popcorn and beer. Oh and if you talk to us, we'll give to a raffle ticket to win super gear and stuff. 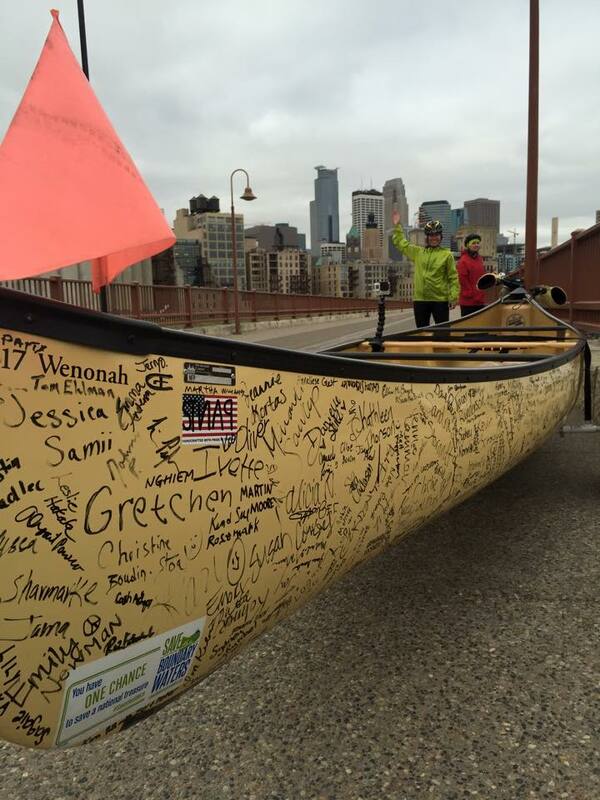 April 25 in Minneapolis: 539.56 miles to date, 23 days done, and many miles more until we have successfully towed a 70 lb canoe from Winona to Ely by bike. Feeling strong and fueled by all our supporters. 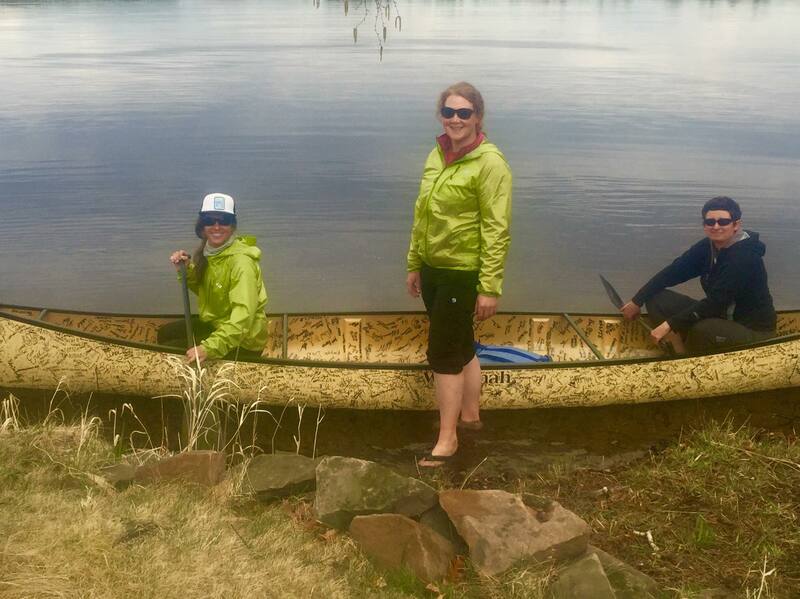 April 29 nearing Duluth: The riders took the canoe for its maiden voyage and shared the name they chose for the canoe: "Betty Joe." Named for Congresswoman Betty McCollum, who introduced the National Park and Wilderness Waters Protection Act on April 15, and Joseph Goldstein, a 14-year-old with acute lymphoblastic leukemia devoted to protecting the Boundary Waters who delivered more than 60,000 petitions, collected by the Campaign and partners, to Washington, D.C., in March. See the riders' video explaining why they chose this name. Mileage total as of April 29: 649!! 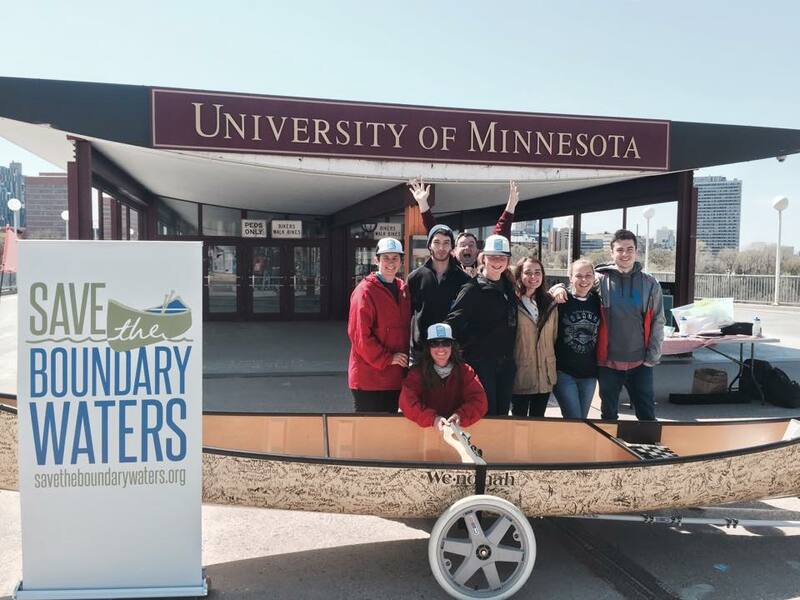 Find the final Bike Tour to Save the Boundary Waters events here, including events in Duluth and Two Harbors before the closing celebration in Ely. Q: What is the best way to prepare for a 700+ mile bicycle tour ... in April ... in Minnesota? 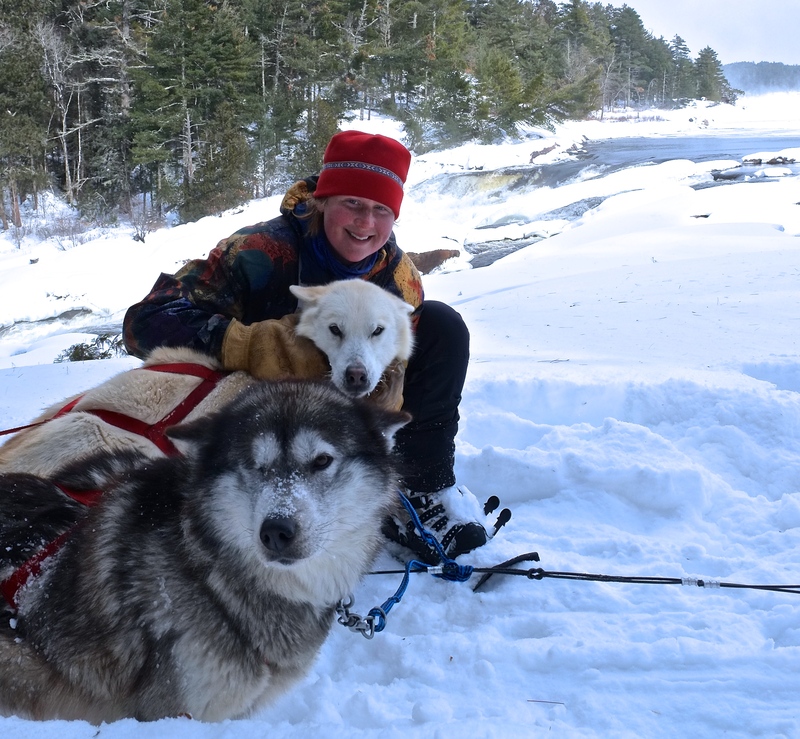 A: I don’t know, but I’m going dog sledding. The mission. Gaining permanent protection for the Boundary Waters watershed is a cause for which I’m willing to lose sleep - and more. When your eyes are red from staring at a computer screen, educating yourself on all sides of the issue and your brain has been fully wracked thinking of what you’ll need, where you’ll go, and who else will support you, all it takes is one glimpse of the wilderness in a memory, a photo, or a glance out the window for some of us, to get a second wind. The team. There is an amazing group of people standing behind this operation. These people: the Campaign to Save the Boundary Waters; Sustainable Ely; Piragis Northwoods Company; and our myriad of sponsors, donors, friends, allies, and of course, my fellow riders, are the reason this tour is a reality. Cross-training. What better way to get in shape for a 725-mile bike ride than leading cross-country skiing and dogsledding expeditions in the very place we are aiming to protect? I work as an instructor for Voyageur Outward Bound School in Ely and thanks to the hardworking team behind the tour, I was able to continue doing what I love throughout the planning phase. For the month leading up to the tour I instructed a 30-day course in which we traveled on two separate expeditions and built a dog sled in between. With four incredible students, 13 quirky yet hardworking dogs, and one intrepid co-instructor, we were able to cover a lot of ground—physically and mentally—in some extreme temperatures and wind. We even made it up to see Curtain Falls at the edge of Crooked Lake—a sight not commonly seen in the winter due to its remoteness. That right there will have been worth the saddle-sore I’m sure to experience due to my lack of actual bicycle time prior to the ride. 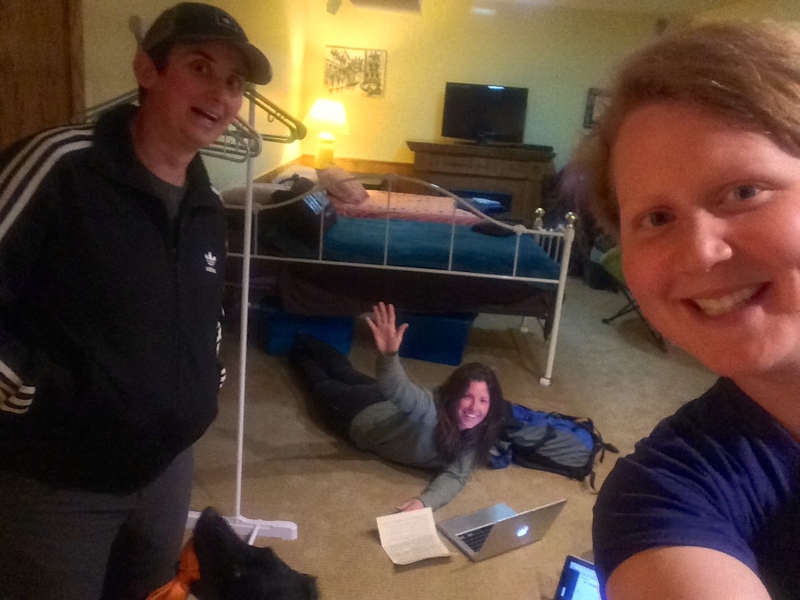 Last night, the three of us riders have finally converged in the same place, the place where most great adventures begin—my parents’ basement in Apple Valley. It’s great to finally be in the same room with these two women laughing about everything and worrying about (almost) nothing. So, tomorrow we begin. Tomorrow we walk (ride) the talk and take action to save the place we love, need and want to share. Check out the webpage for a listing of events and connect with us on Facebook, Twitter, and Instagram. Please spread the word and come see us in a community near you. 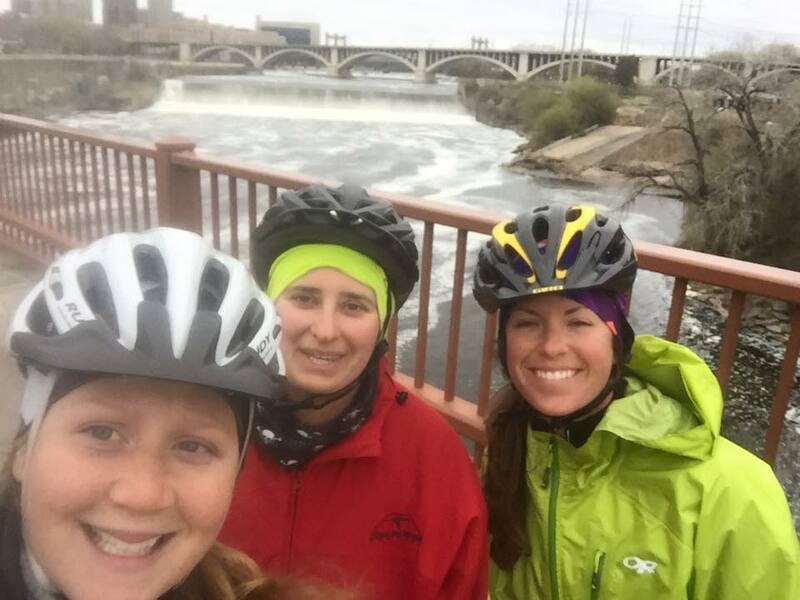 Inspired by the Paddle to DC expedition last year, three dedicated young women: Erin, Iggy and Lisa -- wilderness guides from Voyageur Outward Bound School near Ely -- are gearing up for the Bike Tour to Save the Boundary Waters, which begins in Winona on April 2. From there they’ll head across the state. The route takes the riders from Rochester, Mankato, St. Peter and Northfield up into the Twin Cities and St. Cloud, then finally to Duluth and Two Harbors before arriving in Ely on Mother’s Day, May 10. 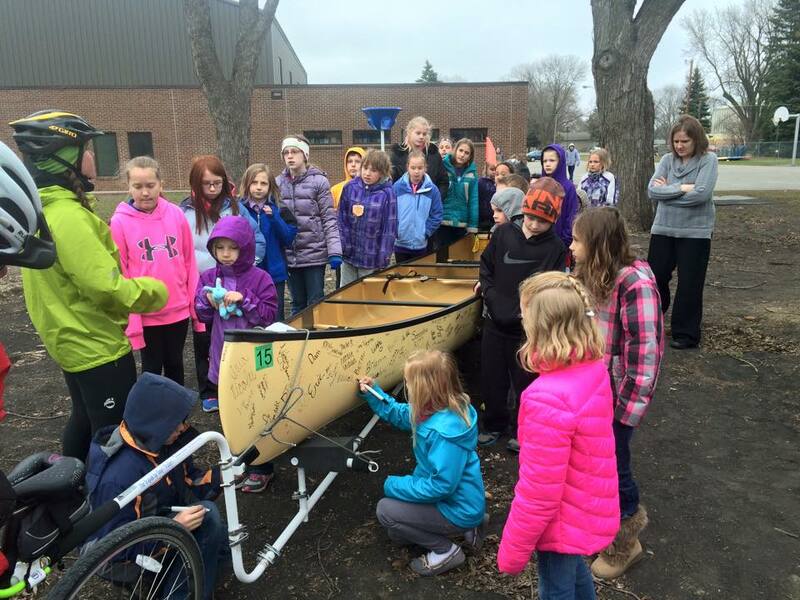 Behind their bikes the riders will pull a donated Wenonah canoe that will become covered in signatures. Their goal is to connect with thousands of people along the way, expanding the power of our movement. I’m the lucky one who gets to work directly with these riders, and our full team of supporters here at the Campaign to Save the Boundary Waters to make sure this ride has the biggest impact possible. I’ve been in touch with student groups and professors, business owners and local organizations, gear shops and cyclists and restaurants and breweries. 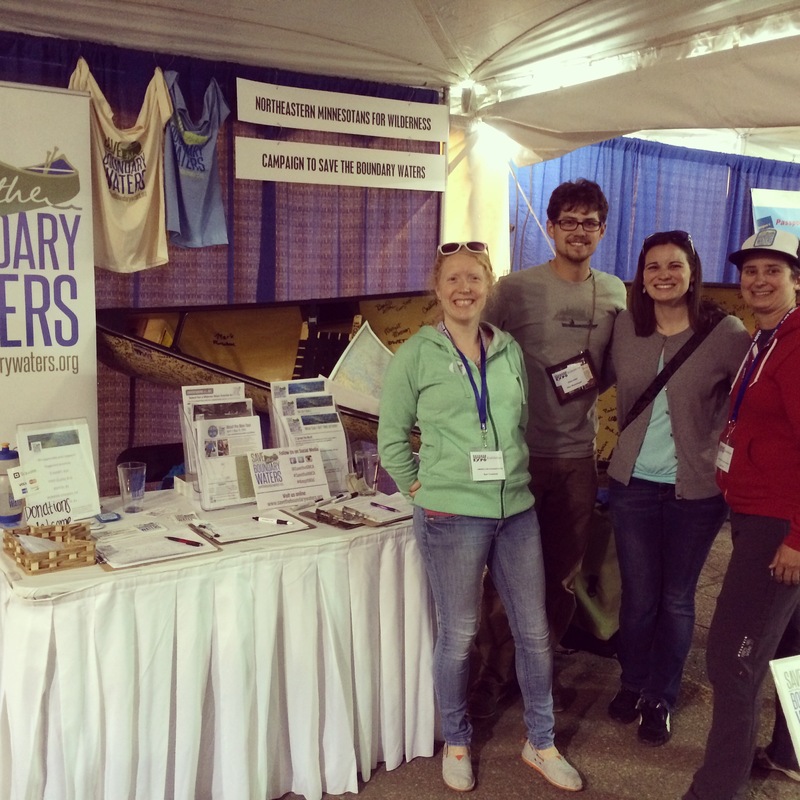 It’s a lot of work to put together massive outreach projects like this, but it’s a blast to find so many allies in this work and connect over our desire to protect the Boundary Waters for generations to come. We believe in the power of outdoor experiences to transform lives. 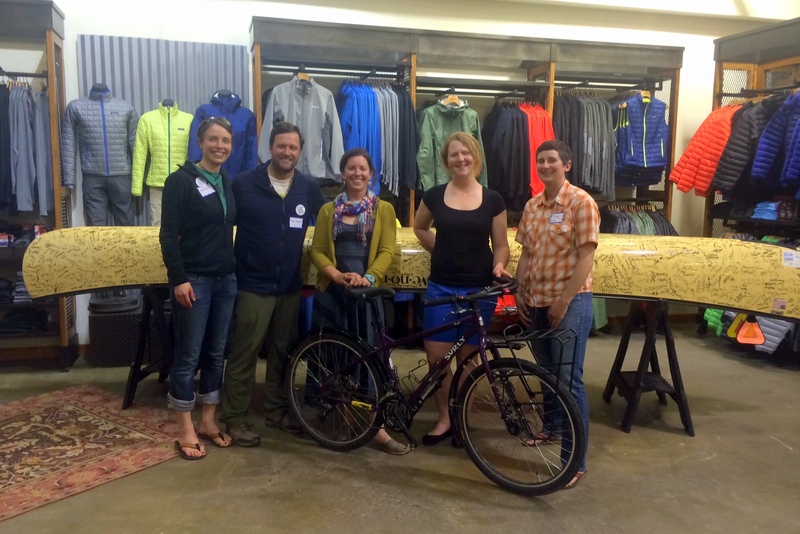 So when we engage in advocacy – why not make it adventure advocacy? A human-powered journey across the state – sure it’s hard, but the riders take it on with such excitement! Are there logistical challenges of coordinating 27 public events in the span of a few weeks? Yes! It’s tough but we do what it takes to reach thousands of new people for the cause and create the kind of visibility this issue deserves. And we work so hard because we’re up against tough opposition. Big mining companies are proposing sulfide-ore copper mines -- a new type of mining never before done in Minnesota -- right on the edges of the Wilderness. Everywhere this type of mining is done, it causes pollution. 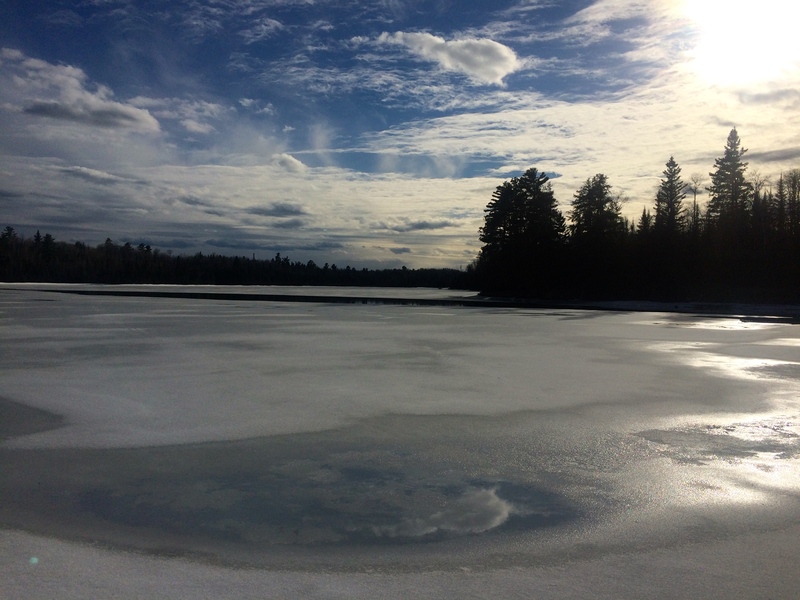 Twin Metals already has mineral leases along the South Kawishiwi River and test drilling disrupts the solitude of the wilderness edge at places like Voyageur Outward Bound School. Ours is a people-powered movement to convince our leaders that the Boundary Waters is worth protecting, that these new mines would do more harm than good and we should put the whole area off limits to mining and save it for future generations. You’re sure to hear more from our Bike Tour team in the weeks to come. We hope to see you along the route! Check out our webpage and listing of events. Connect with the riders on Facebook, Twitter, and Instagram. Please spread the word and come see us in a community near you.